A shot of the rover next to one of the deployed radio antenna arms shortly after the test wrapped up on July 26, 2013. MOFFETT FIELD, Calif. — An astronaut aboard the International Space Station successfully operated a rover on Earth's surface Friday (July 26), helping lay the foundation for future human-robot partnerships that could push the boundaries of planetary exploration. 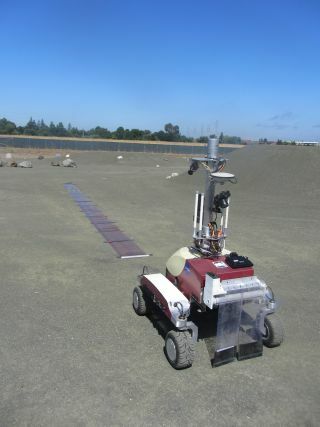 While zipping around Earth several hundred miles above the planet's surface, European Space Agency astronaut Luca Parmitano drove a 220-pound (100 kilograms) rover across a moon-mimicking landscape here at NASA's Ames Research Center, even ordering the robot to deploy a simulated film-based radio telescope antenna. "I think that the future of exploration is such that you'll have to have both humans and robots working together," said Terry Fong, human exploration telerobotics project manager and director of the Intelligent Robotics Group at Ames, which designed and manages the tests. After the trial, NASA Ames' Terry Fong (left) looks at a computer screen showing the K10 rover and its surroundings. "It doesn't necessarily mean humans and robots always closely coupled in space or even time; you could have robots working ahead of humans, robots working in parallel, robots following up," Fong told SPACE.com. "But part of that is really trying to understand, well, if you're going to build these systems, what do you need? How do you build them?" The tests at Ames simulate a mission in which astronauts parked at Earth-moon Lagrange point 2 — a gravitationally stable spot located about 40,000 miles (64,000 kilometers) above the moon's surface — operate a rover on the lunar farside. Such a mission would have many benefits, advocates say. For example, the rover could deploy a radio telescope antenna, which would return great data to astronomers thanks to the "quiet zone" found on the moon's farside. The teleoperated rover could also collect ancient farside rocks for delivery back to labs on Earth. "The twofer that you would get out of this for science is pretty exciting," said Jack Burns, director of the Lunar University Network for Astrophysics Research at the University of Colorado, Boulder, which developed the mission concept. Burns hopes such a mission will launch in 2021, on the first manned flight of NASA's Orion capsule and Space Launch System rocket. The tests at Ames — which use the four-wheel, 4.5-foot-tall (1.4 meters) K10 rover — are steps toward making that dream come true, he said. "We have demonstrated for the first time that an astronaut can operate a rover and do some relatively sophisticated commands," Burns told SPACE.com. "It's baby steps, but it's a good set of baby steps."